Step 1. Scrape back any stones covering the area. For rusty metal modified / granulated roofs, stucco, concrete, wood or other porous surfaces - blow or brush off loose or heavy dust / dirt. Coat surface with a light coat of EternaPrime®. Step 3. Remove release liner. 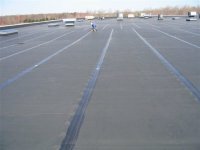 An example of a full restoration on an EPDM roof.